Tailoring is the art of designing, cutting, fitting, and finishing clothes. The word tailor comes from the French tailler, to cut, and appears in the English language during the fourteenth century. In Latin, the word for tailor was sartor, meaning patcher or mender, hence the English "sartorial," or relating to the tailor, tailoring, or tailored clothing. 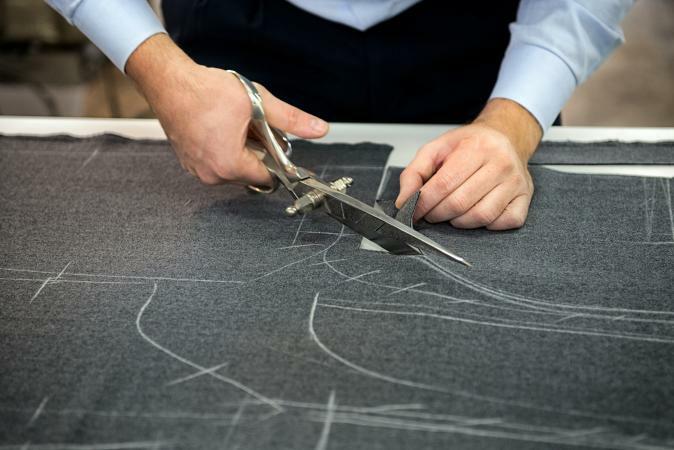 The term bespoke, or custom, tailoring describes garments made to measure for a specific client. Bespoke tailoring signals that these items are already "spoken for" rather than made on speculation. As a craft, tailoring dates back to the early Middle Ages, when tailors' guilds were established in major European towns. Tailoring had its beginnings in the trade of linen armorers, who skillfully fitted men with padded linen undergarments to protect their bodies against the chafing of chain mail and later plate armor. Men's clothing at the time consisted of a loosely fitted tunic and hose. In 1100 Henry I confirmed the royal rights and privileges to the Taylors of Oxford. In London, the Guild of Taylors and Linen Armorers were granted arms in 1299. They became a Company in 1466 and were incorporated into the company of Merchant Taylors in 1503. In France, the tailors of Paris (Tailleurs de Robes) received a charter in 1293, but there were separate guilds for Linen Armorers and Hose-Makers. In 1588, various guilds for French tailors were united as the powerful Maitres Tailleurs d'Habits. Tailoring has traditionally been and remains a hierarchical and male-dominated trade, though some women tailoresses have learned the trade. In the sixteenth and seventeenth centuries, tailors were responsible for making a variety of outer garments including capes, cloaks, coats, doublets, and breeches. They gave shape to them by using coarse, stiff linen and canvas for interlining, horsehair cloth and even cardboard stiffened with whalebone for structural elements. Imperfect or asymmetrical body shapes could be evened out with wool or cotton padding. Luxury garments were often lined with satins or furs to keep their wearers warm. Tailors were the structural engineers for women's fashions and made whalebone stays or corsets until the nineteenth century. Women largely made relatively unshaped undergarments and shirts for men, women, and children. The nineteenth-century tailor added trousers, fancy waistcoats, and sporting clothing of all sorts to his repertoire. The tailor was particularly adept at working woolen fabrics, which he shaped and sculpted using steam and heavy irons. Menswear had long used wool as a staple fabric. In Britain wool connoted masculinity, sobriety, and patriotism but in the early nineteenth century, it became extremely fashionable, almost completely replacing the silks and velvets used in the previous century. At the same time, men began to wear trousers rather than breeches and by the 1820s, tightly cut trousers or pantaloons could be worn as evening wear. Though they no longer made corsets, women's sidesaddle riding habits and walking suits remained the province of the tailor and were cut and fashioned from the same fabrics as male garments. Because tailoring was taught by traditional apprentice-ships, skills were passed on from master to apprentice without the need for written manuals. The most skilled aspect of the trade was cutting out garments from the bolt of cloth. In G. B. Moroni's painting The Tailor (c. 1570), the fashionably dressed artisan prepares to use his shears on a length of cloth marked with tailor's chalk. These markings would probably have been based on a master pattern. The earliest tailors used cloth patterns because paper and parchment were too expensive at this period. Paper patterns became widespread and commercially available in the nineteenth century. The earliest known tailoring manuals are Spanish. These are Juaan de Alcega's Libro de Geometric Practica y Traca of 1589 and La Rocha Burguen's Geometrica y Traca of 1618. These books illustrate ways of drawing patterns to use fabric in the most economical manner, but have no information on technique. Later manuals, such as the important L'Art du Tailleur by de Garsault (1769) have more detailed instructions as to measurement, cutting, fit, and construction. The typical workshop had a master tailor, who dealt directly with the client and cut out garments. There might be several cutters in a large establishment and they were at the top of the tailoring hierarchy, for cutting out was the most skilled part of the trade. Under them other journeymen tailors were responsible for a variety of activities, including padding and sewing in interlinings, pockets, and the difficult task of assembling the sleeve and turning the collar, as well as manipulating the heavy shaping iron called a goose. Apprentices were usually responsible for running errands and sweeping up scraps of fabric before being taught basic sewing skills. When sewing machines were introduced, machinists, who might be women, were also added to the workshop floor. The tailors who sewed the garment together sat on a workbench near natural light with legs crossed, hunched over their work. To sit cross-legged in French is still to be assis en tailleur, or sitting in the tailor's pose. The first manual in the English language is the anonymous The Taylor's Complete Guide, published in 1796. After this publication, there were many important manuals produced during the nineteenth century, including Compaing and Devere's Tailor's Guide (1855) and most importantly, E. B. Giles's History of the Art of Cutting (1889) which has been reprinted and provides great insight into the nineteenth-century techniques from a master tailor who knew many of its practitioners personally. A spirit of competition and enterprise marked the first half of the nineteenth century, when tailors patented a multitude of inventions, manuals, systems of measurement, and fashion journals aimed at the man-about-town and his tailor. Some of the most important of these were the Tailor and Cutter and West-End Gazette. The endless cycles and revivals of women's fashions seemed illogical and capricious compared to the more rational, linear, and technologically innovative development of men's dress. The finest tailoring combined the principles of science and art to produce clothing that was both engineered and sculptural. Systems of measurement changed radically during the history of tailoring. Tailors have always had the difficult task of creating three-dimensional garments for asymmetrical and highly varied body shapes. Unlike static sculpture, garments also had to allow the wearer to move freely and gracefully during their daily pursuits. Early tailors developed complex systems for measuring the bodies of their clients. However, as most manuals observe, no system could replace the observant eye and hand of the tailor, who noted the more subtle nuances of his client's posture and anatomy and could make allowances for a slight hunch, uneven shoulders, or a protruding stomach. In his tailoring manual of 1769, de Garsault illustrated the strip of paper he used for taking measure. His system involved cutting notches in the strip to measure the breadth of the back and the length of the arm to the elbow. Each client was measured against shifts in his own body's size and shape. The modern tape measure was introduced in about 1800. In Britain, cloth had been accurately measured in ells (short for elbows), but the body was not quantified in units. In post-revolutionary France the metric system was used to measure the body, whereas British tailors favored inches. The tape measure was soon joined by a compass, ruler, and tracing paper to produce elaborate geometric systems used throughout the nineteenth century. These mathematical patterns could be produced in scaled sizes and were designed around the more abstract idea of a bodily norm or average. In their most elaborate forms these systems used machines like Delas's somatometer or body meter of 1839, which was an adjustable metal cage for measuring the bodies of clients. Entrepreneurs who used them to produce ready-made clothing in standardized sizes gratefully appropriated systems designed to ensure a more accurate fit. Reporting on the inroads made by ready-made tailoring exhibited at the 1867 World's Fair in Paris, Auguste Luchet wrote that the age of the sculptural tailors was over: "There are no more measurements, there are sizes … Meters and centimeters. One is no longer a client, one is a size eighty! A hundred vestimentary factories are leading us toward the absolute and indifferent uniform." Though loosely fitting, ready-made clothing for the lower classes had existed since the seventeenth century, the nineteenth century saw the introduction of high-quality, fitted tailored garments sold off the rack. The fully equipped tailor's establishment of the nineteenth and twentieth centuries could be sparsely or luxuriously fitted. The basic requirements of the trade included shelving for the display of cloth bales, a counter where swatches could be consulted, a space where the client could be measured, a fitting room with mirrors, a sturdy table for cutting out, and possibly blocks for saddles to fit riding clothes properly. Fashion prints were also hung as decoration or shown to clients as models. The shop might or might not include a space for workshops. More prestigious firms made garments on the premises while "jobbing" tailors sent bundles of pieces to outworkers, often women, who would assemble the garments at home or in sweatshops. At the top end of the scale, establishments like Henry Poole on Savile Row at the turn of the twentieth century combined more functional elements with the thick carpets, mahogany fittings, satin upholstery and gilded mirrors of the palace or exclusive gentlemen's club. In the twentieth century many tailors kept traditional interiors, though some, like Simpsons of Piccadilly and Austin Reed innovated with modern, Art Deco, or Bauhaus styles and included amenities such as barbershops. In the middle of the nineteenth century, the tailor was joined by hosiers, who specialized in high-end accessories and outfitters, whose trade was based on made-to-measure shirts, but who also sold suits, coats, hats, boots, and all manner of accessories. Their shop window displays tended to emphasize orderliness and neatness to appeal to the male customer. 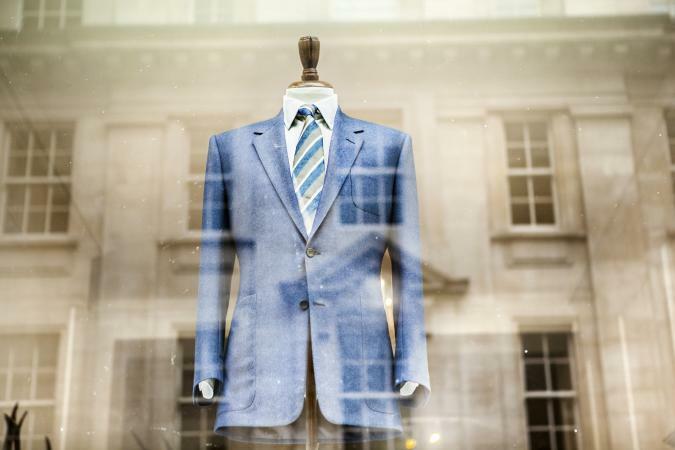 Bond Street, Savile Row, and St James's Street in the fashionable West End of London have been the center for elite, traditional tailoring since the turn of the eighteenth century. However, tailoring spanned the whole class spectrum, from tailors with royal warrants to immigrants working in the warehouses of the East End. One of the most important shifts in Savile Row tailoring was the transition from a more traditional client base of British gentry and aristocracy to a more international, clientele including American financiers and eventually Hollywood celebrities. Though Savile Row rose to prominence in the late eighteenth century, dressing such figures as the Prince Regent and dandy Beau Brummel, in the twentieth it created the movie wardrobes of Fred Astaire, Cary Grant, and Roger Moore. Though many American stars sought the cachet of Savile Row, there were very talented tailors in the United States. In Harlem, the exaggerated shapes and bright colors of the zoot suit were launched by stylish young black men in the mid-1930s. When the War Production Board tried to curtail this "antipatriotic" tailoring because of wool rationing in 1942, race riots ensued. In Britain, there was a brief revival in elegant Edwardian tailoring after World War II, when so-called Teddy Boys-working-class men who spent large sums on their wardrobes-adopted it. In 1960s London, fashionable men's goods were democratized in the "Peacock Revolution," which saw the center of fashion gravitate toward Carnaby Street and the King's Road-along with Cecil Gee, John Stephen, John Michael, John Pears, Michael Rainey, and Rupert Lycett Green. One of the most important figures in the rejuvenation of menswear was the celebrity tailor Tommy Nutter. He created unique suits for both men and women, including suits for the Beatles, Mick and Bianca Jagger, and Twiggy. In the 1980s, Italian tailoring began to receive more attention on the international fashion scene. With their "unstructured" suits, designers such as Giorgio Armani catered to a desire for more informal, lighter weight garments for both men and women. At the turn of the millennium, the Italian tailoring firm Brioni dressed the British movie icon James Bond, played by the actor Pierce Brosnan. In Britain, a new generation of designers combine the flawless cut and construction of traditional tailoring with the flair of haute couture. Ozwald Boateng is an Anglo-Ghanian whose work displays a dazzling sense of color and who prefers to describe his work as "bespoke couture." Alexander McQueen, who trained for a short two years on Savile Row, also incorporates tailoring's emphasis on structure and materials into his couture womenswear. Though it represents a very small part of the contemporary menswear market, custom tailoring still has pride of place in the wardrobe of the sharply dressed man. Whether it applies to computer software or kitchens, the expression "tailor-made" still carries positive connotations of individualized, customized service. In the clothing trade, as long as the suit remains the classic form of formal attire, tailors will elegantly dress their clients. These may include men whose bodies may not fit the norms of the ready-made clothing industry, as well as royalty, businesspeople, or celebrities who turn to the tailor for a classic or innovative suit of clothing made to their precise measure. See also Giorgio Armani; Cutting; Savile Row; Sewing Machine; Business Suit. Breward, Chris. 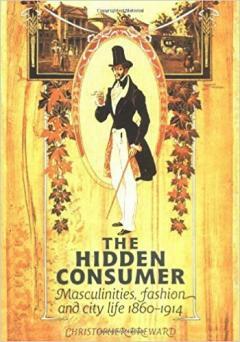 The Hidden Consumer: Masculinities, Fashion and City Life 1860-1914. New York and Manchester, U.K.: Manchester University Press, 1999. --, ed. Fashion Theory 4, no. 4 (December 2000). Special issue focusing on "masculinities." Garsault, M. de. L'Art du Tailleur [The art of the tailor]. Paris: Académie Royale des Sciences, 1769. Giles, E. B. The History of the Art of Cutting in England. London: F. T. Prewett, 1887. Luchet, Auguste. L'Art Industriel à l'exposition universelle de 1867 [Industrial art at the 1867 World's Fair]. Paris: Librairie Internationale, 1868. Walker, Richard. The Savile Row Story. London: Prion, 1988. Waugh, Norah. The Cut of Men's Clothes, 1600-1900. London: Faber and Faber, 1964.